One of the city's, and the world's, greatest residential skyscrapers, the San Remo is the city's most beautiful apartment building and one of its most prestigious addresses. 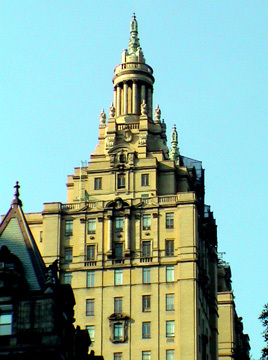 Like the Beresford a few blocks north on Central Park West, the twin-towered San Remo is one of the masterpieces of architect Emery Roth, whose firm, Emery Roth & Sons would subsequently design more office buildings in the city than any other firm. It and the Beresford (see The City Review article) were sold in 1940 for $25,000 over the existing mortgages as the buildings suffered during the Depression, although both have recovered very, very well. The San Remo replaced a 10-story hotel of the same name on the site that had two pyramid towers. Emery Roth's design for dividing the top of this 27-story building into two-10-story towers was the first such scheme in the city and was quickly copied by three other twin-towered buildings on Central Park West, the Century, the Majestic and the El Dorado (see The City Review article). Construction began on the San Remo in 1929 as the Beresford was being completed. That year the city enacted its Multiple Dwelling Act and that law allowed residential buildings of greater height than previously permitted in exchange for larger courts and yards. Roth's design met with the new law's requirements that towers not exceed 20 percent of the site and be setback 70 feet on all sides. His twin-towered solution created more apartments with more light and air and also reduced space lost to long elevator corridors. 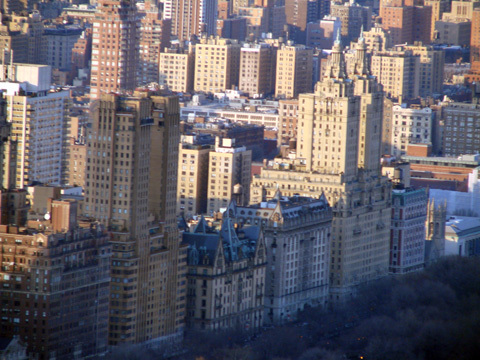 In his excellent book, "Mansions In The Clouds, The Skyscraper Palazzi of Emery Roth," 1986, Balsam Press Inc., Steven Ruttenbaum noted that "the San Remo's two towers convey a lyrical, uplifting feeling, similar to the religious aura of a medieval cathedral." "The circular temples at each top, which were inspired by the ancient Greek Choragic Monument of Lysicrates that Roth had studied at the Chicago world's fair, reinforce those spiritual connotations," Ruttenbaum wrote. "For a certain upwardly mobile section of the population, there is no mistaking the message written on these walls of buff brick and terra-cotta: What lies within are sumptuous quarters for those who aspire to live like old-world nobility in new-world, high-rise glamour," Ruttenbaum observed. The three-story base of the block-long building are covered with limestone and while the overall appearance of the building is a harking back to classical themes, the entrances and lobbies have some Art Deco motifs. The brick and terra-cotta facades of the rest of the building are nicely modulated with a great sense of rhythm and finesse. The towers, for example, have no corner windows but protruding piers that reinforce the sense of monumentality. The transition from the 17-story base to the towers, furthermore, is achieved with setbacks and terraces that provide visual interest but not so much as to distract from the overall composition. What truly distinguishes the 400-foot-high towers from the other twin-towered silhouettes on Central Park West is the transition of the rectilinear towers "into circular, Roman-style temples ringed by Corinthian columns 16 feet high and by urns with finials that measure 8 feet," Ruttenberg observed. The "temples" are topped with copper finials containing bright beacons, one of which tilted and had to be repaired in the 1970's. 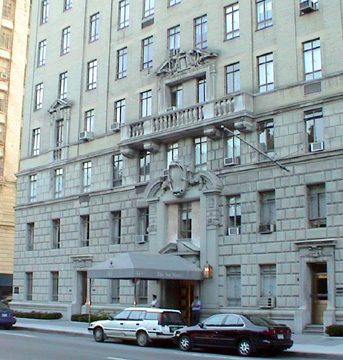 Like the Beresford, the San Remo is actually a U-shaped structure despite its appearance from the street, as a courtyard is carved out of its west side. The San Remo was designed for 122 apartments, but that number grew over the years by another 20 or so as some of the larger units were subdivided. The layouts were quite large with many apartments having rooms with different ceiling heights. Fireplaces were in all of the units, but no longer work. The windows were an innovative design as the top transom swings out and the lower transom swings in, an attempt to improve ventilation. With its better views of midtown, the south tower was considered more desirable and originally was built with duplex apartments while those in the north tower are single-floor units. Despite their famous appearance from Central Park, the towers are not symmetrical and bulge a bit on the west frontage. Despite its innovative design and grandeur, the San Remo was a victim of the Depression and a year after it opened more than a quarter of the units were not yet occupied and the bank that held its mortgage folded and the building fell into bankruptcy. The San Remo, the Beresford, and the Dakota are the three most prestigious and spectacular apartment buildings on the Upper West Side. Each has its merits and advocates who claim it is the best. The Dakota, being the oldest, has tremendous history and mystery. The Beresford is just overwhelming. 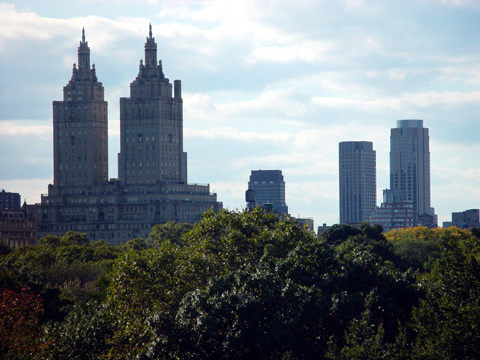 The San Remo, being the tallest along Central Park West, has the highest visibility as well as the best location and is the most imposing and elegant-looking. In "New York 1930, Architecture and Urbanism Between the Two World Wars," (Rizzoli, 1987), authors Robert A. M. Stern, Gregory Gilmartin and Thomas Mellins observed that "The building brought together for the first time the shared communality of the imperially scaled courtyard apartments of the pre-war era and the high-density, Babylonian urbanism of the skyscraper." In his excellent book, "New York Streetscapes, Tales of Significant Buildings and Landmarks," (Harry N. Abrams, Inc., 2003), Christopher Gray devotes a chapter to the San Remo and notes that "An ad for the San Remo in the Times in April 1930 called it 'as modern as a flying boat, as luxurious as the Ile de France and designed for people who are at home on both. Birds in the sky are your only neighbors."